If players manage to beat the modified game, a more difficult Second Quest mode is unlocked, allowing for a more traditional difficulty. 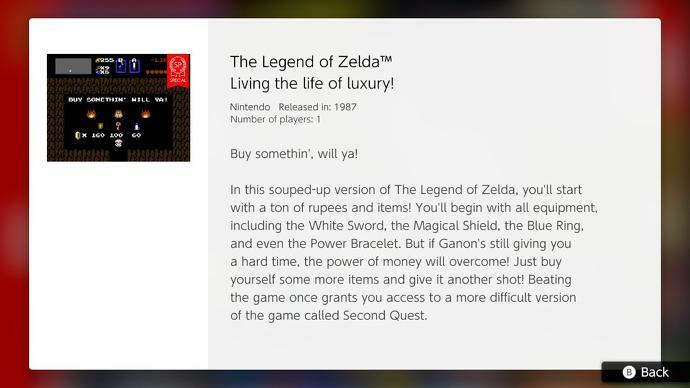 Nintendo’s Switch Online service had a bit of a rough launch over the last month with confusion over cloud saves and concerns over its value, but the company is continuing its commitment to offering classic NES games for subscribers. As previously scheduled, Solomon's Key, NES Open Tournament Golf, and Super Dodge Ball arrived this morning on the service. Nintendo also included a special bonus for subscribers in the form of a unique version of The Legend of Zelda. In this special version of The Legend of Zelda with a modified save file, players begin the journey equipped with all equipment, including the White Sword, Magical Shield, the Blue Ring and the Power Bracelet. Additionally, player will have a full complement of items and a large stash of rupees. Should players beat this “training wheels” version of the game, a new playthrough dubbed “Second Quest” is made available. This new variant will provide a much greater challenge to players. A modified version of The Legend of Zelda reminds us of the 8-bit days of yore, when players could use a Game Genie to alter games and allow for cheats and alternate modes. For a full list of all the NES games coming to Nintnedo’s Switch Online service, refer to our handy guide. Very cool. I will start this up after I finish Gradius. I'm actually playing a lot more of the Switch Online games than I thought. It's a lot easier to boot up my switch than to futz with the NES Classic.